Monitor technologie has experienced a rapid development lately and now demands much more from a measurement instrument than before. Video, cinema, presentation, medical applications... require monitor instruments with highest precision, signal to noise ratio and longevity. basICColor DISCUS is made to measure for these demanding fields of application. The high-end colorimeter basICColor DISCUS offers the precision and flexibility of a lab-grade instrument in the compact design of a hand-held instrument. The built-in temperature sensor in basICColor DISCUS compensates for incremental heating during a measurement session. Thus you can be sure to get reliable and constant measurement values even in the critical dark areas. With a basICColor DISCUS you are equipped for all measurement tasks. It masters contact and tele measurement with laser pointer, as well as measurement of (ambient) light. Thanks to the intelligent design, the flat calotte is mounted in parallel with the paper surface. It can also be positioned rectangularly to the light source with the help of the laser pointer. 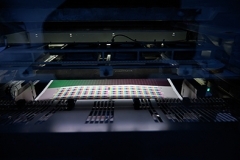 Loadable calibrations make for a guaranteed future – basICColor DISCUS is easily adaptable to any future display technology. Subscribe to the basICColor newsletter! Sign up to our newsletter now and we will inform you about software updates, latest information on products and news from basICColor. Professional production bundle for the printing workflow: Set any offset printing press perfectly to a new printing condition in appx. 1 hour (drying time excluded) – regardless whether it is a new standard (like FOGRA51 or FOGRA52 for example), a new substrate, or even a new printing press. basICColor GmbH offers comprehensive technical support for your products. This support includes assistance with installation, registration and operation of all software and hardware products offered by basICColor GmbH. Questions will be answered either by e-mail, or during business hours by phone. Our specialists provide competent, reliable and timely assistance.